Olympic training continues. In fact, I believe I have acheived a perfect swatch. It makes me very glad that I decided to rethink and redesign a sweater for this yarn. My challenge is not only to finish knitting it, but to create a sweater that I’ll love, and — here’s a concept — maybe even wear. Looks like 4.65 stitches to the inch! Does your monitor express the lovely similarities between the sunrise and the swatch? Mine does. Now I have another big decision to make. Do I join Team Chocolate? Or Team Caffeine? Or both, and I can have chocolate-covered espresso beans? Knitting, thinking about knitting, and reading about knitting has kept me from going insane this week. Pulling book returns is mentally and physically draining, and it took me almost all week to figure out why I’ve been coming home so tired. It’s almost done, though. That is, until next month. I finished the little Kimono Angora scarf in just a few days. I like the way the colors arranged themselves across the surface (pardon the dim photo — right after the sunrise, the clouds thickened). It’s really soft and light, too. And since I promised a little complaining: I’d like to be able to say that I’ve devoted half of my knitting time to the Jaywalkers, but I can’t. I’d rather knit just about anything else. It’s not the pattern — it’s well-written, not complicated, and I know it works. I’m just not enjoying it, and my sock shows it. It’s lumpy and misshapen and forlorn. Is it just me? The scarf turned out beautifully! 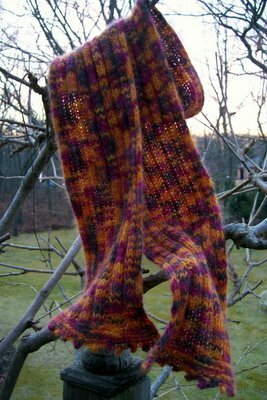 And yes, I can definitely see the similarities between swatch and sunrise – very Knitting Iris! (That’s a good thing. )You don’t have to choose between those two teams if you’re willing to add Merlot to the mix. 🙂 There’s a button for Team Chocolate, Caffeine, and Merlot. 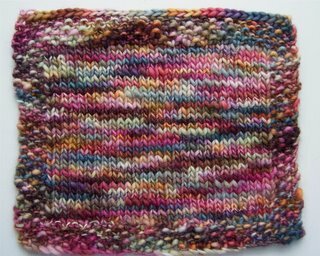 The scarf turned out fantastic – and the swatch for the sweater is divine! Can’t wait to see the sweater and you wearing it! More gorgeous projects from you – the swatch & the scarf – & another beautiful photo!You inspire me, girlfriend.XOXO to you for your day off. I so can empathize with the book- sellers-january-blues… yucky month for you… repeat after me.. its almost done, its almost done…So glad that you are keeping your spirits up up swatching!! And Hey that colorway looks exactly like a sky or two I’ve seen 🙂 From one sky wtacher to another, the colors just don’t get any better do they!Gorgeous scarf too by the way! i hate chocolateso go with the coffeelove coffeelove coffeelove coffeeand yes the colors match the sky…..i love them colors too….vidid I mention I love coffee? Jane, I love the colors in your swatch! Is the yarn scratchy at all? I like that “Team Caffeine” almost rhymes, which lends itself well to cheers.Your swatch is stunning, and I have picked up your Jaywalker slack, so you should feel no guilt at all. We morning people know we are superior.Beautiful beautiful beautiful. As I always find when you’ve posted. 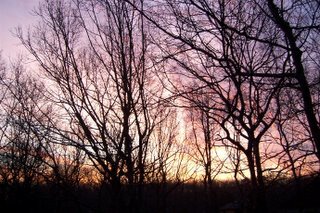 And have you noticed that there’s light by 6 a.m. now and till 6 p.m. The world is turning, tilting us ever closer to that summertime feeling. How I shall yearn for the cold grey days of winter. Why can’t we get some in July? when we need it? I think you should join Team Chocolate. That scarf it beautiful as it flows in the tree. Really nice colors. Your Kimono Angora scarf is so lovely, Jane! Beautiful variegations. Now only if it would get cold enough to wear it, huh? ;)Beautiful swatch too! The swatch is beautiful! A note though – I made an everyday cardigan out of Manos and it pilled HORRIBLY! To the point where I haven’t worn it because it looks awful. I’m still in the process of shaving off the pills and hopefully, I’ve heard, the first time it pills is the worst and then it’s okay, but I thought you should have the benefit of my experience.All that said, I still love the cardigan.